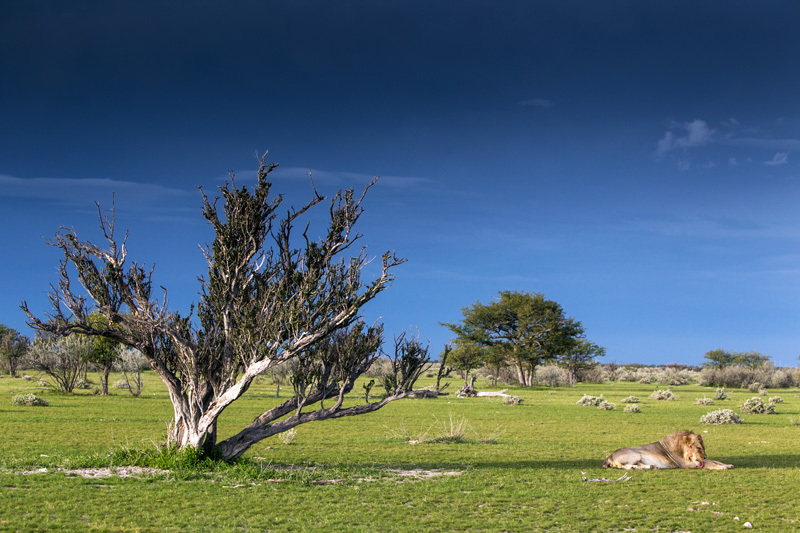 One brother rests, while another takes his turn to feed on a zebra carcass under a tree. When an individually recognizable animal or group of animals is/are seen quite often, they start playing anthropomorphic tricks on your mind. Giving them names is the first step. More scientifically tuned minds may give them more scientific sounding alphanumeric names (e.g. O-192, or Okondeka Male 1), and artistically tuned minds may give them real people or mythological names. I’ve been following the Okondeka lion pride whenever I can since 2012. At one point, there were twenty five of them together, an incredible sight. However, this year they seem to have scattered, temporary pride fission or a permanent split I cannot say. I only once saw that incredibly large male that led the pride. I fear for him, and hope I can see him again. The young cubs and sub-adults from 2012 are much larger now, and there are a new set of cubs. 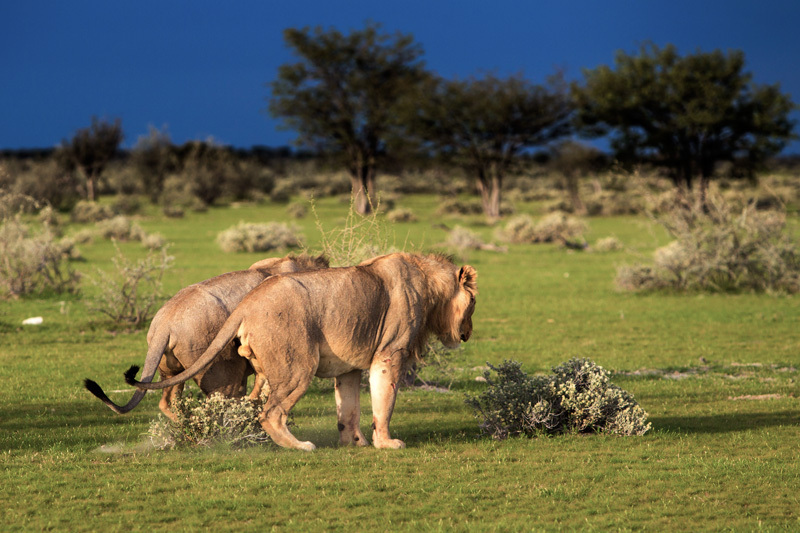 However, what’s intriguing is that there is an awful lot of male lions – young and old – in the area. A few weeks ago, I saw six males together under a tree: two very old ones, two adults and two sub-adults. That’s quite an eclectic crowd. I know the two old ones, they are usually seen on old carcasses (or fresh anthrax carcasses) and have several old battle scars and a balding head. I also know the others. 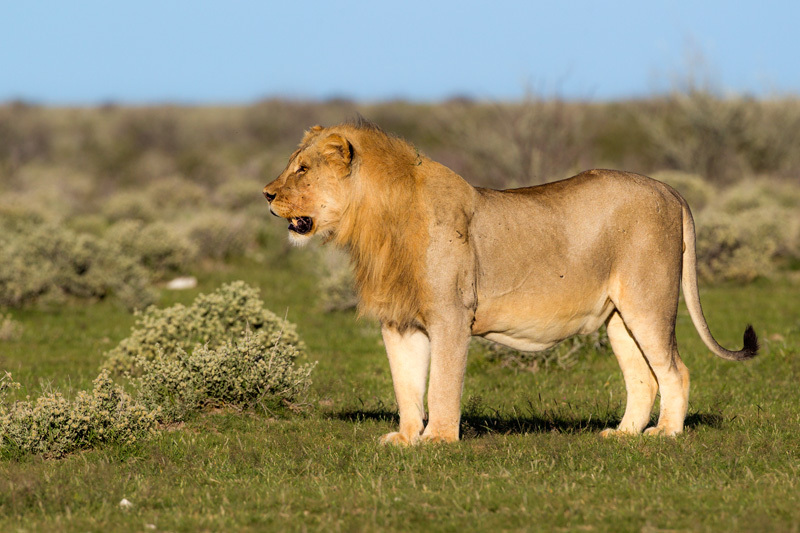 The sub-adults were only playful cubs in 2012, and the adults had slightly less mane last year. Coming across them is a very pleasant experience. The two brothers seem to be building up a partnership, perhaps in the hope of getting their own pride land someday. Or did they take over the land they grew up in? It looks like they are a little too old to be still around, and they seem to be doing all the scent-marking stuff that only cats that hold territory indulge in. Even if those are not signs of territorial holding, these two brothers are worthy enough have a pride of their own. They are two of the biggest lions I’ve seen this season (and I’ve seen about 50 so far). I do hope they get that black mane their father has (had?). For now, I’m calling them Obi-wan and Kenobi. Obi-wan is a corruption of OB-1 (Okondeka Brother 1), and then not much imagination is needed to add a Kenobi. I’ve run into the brothers about half a dozen times in the last two months, and I don’t go out often these days because of my rather busy schedule. And it is always fun photographing them. 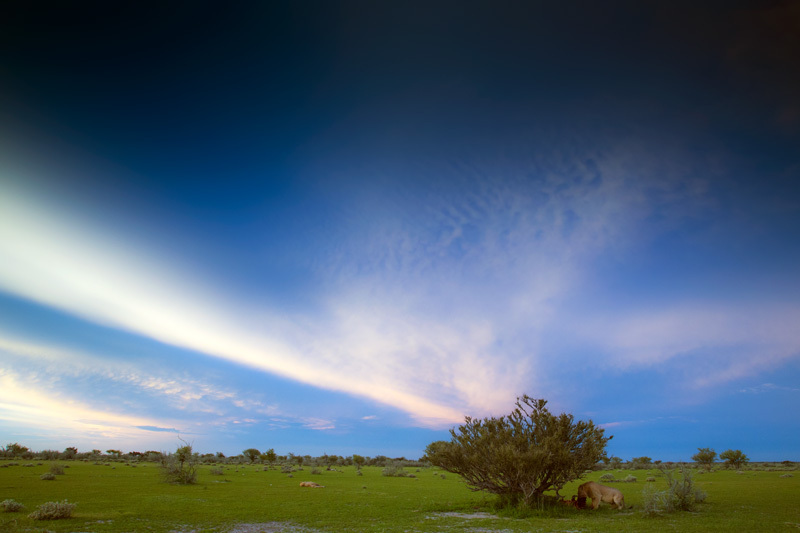 I do hope I can see them around these parts for years and years to come, although I’m not entirely sure when I will be back in Etosha again. 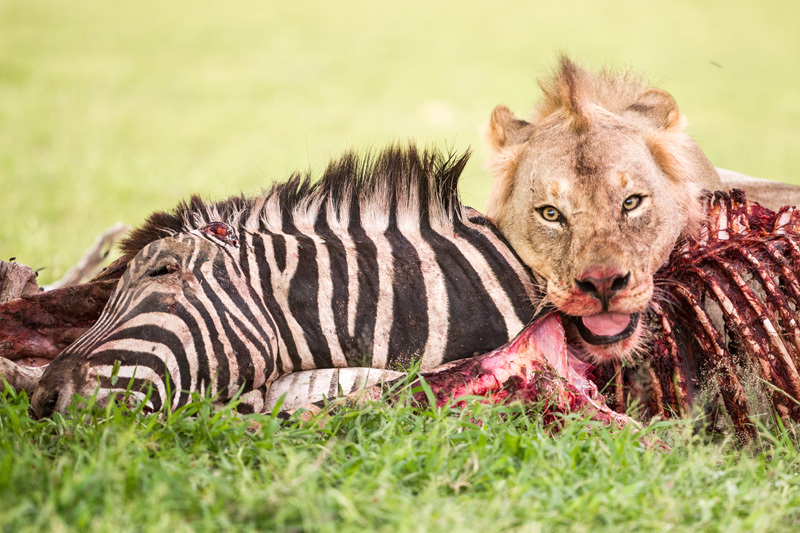 Obi-wan feasting on a zebra. The two brothers marking a bush. Together! 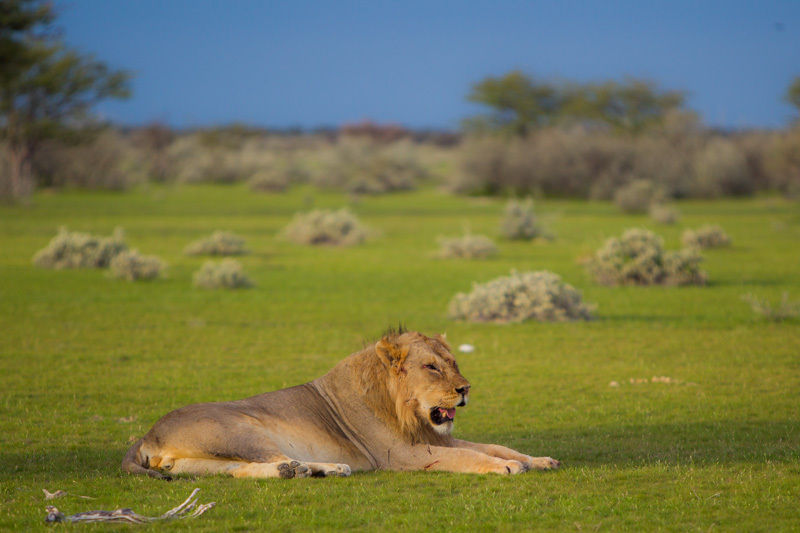 Kenobi, the smaller brother rests on a short-grass veld. Obi-wan, the big brother. The underbelly fat layer shows that he’s been eating well.